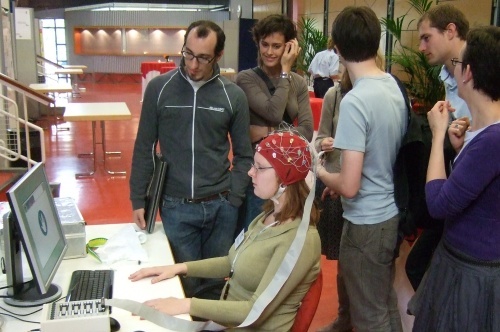 Our position paper has been accepted for the Brain Body Bytes workshop at CHI2010. All the workshop papers have just been posted online (here), and it looks really interesting. They are available online for free, so do check them out. Can’t wait to go there! and the Dutch Ministry of Education, Culture, and Science, to support applied research. It started in 2007 and will continue for 6 years in total. Each year there is a consortium meeting bringing all partners together, so everybody is kept up to date of all the developments, new collaborations can be initialized, etc. At these meetings, also awards are presented for best poster, press, and demo. For 2009, the demo award went to us for alphaWoW, “as it represents a promising industrial direction of adding a BCI-based channel to existing technologies that cannot be realised in any other way.” It is really awesome to receive such recognition. Thank you BrainGain! In 2008, we also got the demo award, but then for BrainBasher, a simple fun game controlled with imaginary or actual movements, requiring only 10-15 minutes of training. Last week, the yearly BrainGain consortium meeting took place in Bad Boekelo. It was very exciting to see what all the other projects have been up to. As icing on the cake, we even won the best demonstration award with BrainBasher! And that’s not even all: our professor Anton Nijholt also won a prize, for the best press coverage. A lot of pictures have been made. Unfortunately most of the are not available yet, so you will just have to do with this one in the mean time. Fun and Games was interesting and entertaining. It is great to see what other people are working on — there are always more touching grounds than you’d think on first sight. And of course because of the theme of this conference almost everything that is talked about has some fun factor — can’t go wrong there. Andreas Bulling from ETH Zurich was kind enough to make some pictures of our demo setup and mail them to us. Thanks Andreas! Karolien Poels from the Eindhoven Game Experience Lab was positioned next to us, with her work on the Game Experience Questionnaire. Very handy, as we also used that same questionnaire to evaluate different versions of BrainBasher. As I was the test subject, unfortunately I missed the presentations about affect. I’ll just have to read up in the proceedings, but there were many interesting presentations I did see, like the one on EyeMote which uses EOG-based eye gestures for wearable control, but also the rather strange one about project ALICE on cultural computing. The presentation I enjoyed most was the one by Roderick Murray-Smith (who worked on the BCI Hex-o-spell, but also on many other interaction projects like the Stane), which was really an eye-opener to me on how it is possible to break free of established interaction patterns and think up something new that could work just as well or even better. Especially in the case of BCI, which is still so open to possibilities, it is important to try to free the mind to a more abstract way of thinking about interaction. 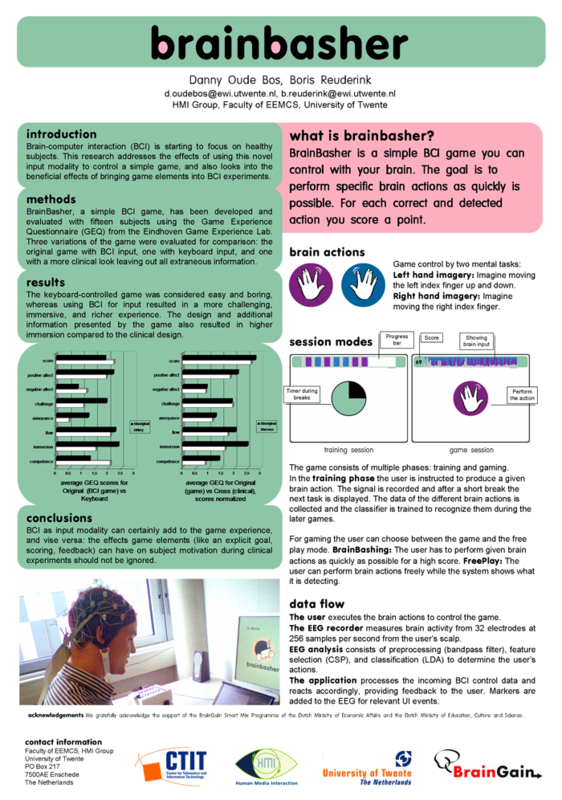 Now we’re already busy preparing for the next poster session and BrainBasher demonstration at the BrainGain consortium meeting at Bad Boekelo next week! Shocking fact: most scientific conference posters are created in Microsoft Powerpoint. No, this is not ‘normal’. The design world uses applications like Adobe Illustrator for tasks like this. Unfortunately, the choice for Powerpoint is not that strange: it can handle vector graphics, and is easy to use. And most scientists will already have some experience with the software for creating presentations.I tried fighting it, but the only alternative software I could use was Corel Draw 9 (published in 1999! ), Word, or … Paint. So now I am converted to Powerpoint as well. After some searching (<3 Google) I found a very helpful site with tips for creating such a Powerpoint poster, which also includes some sample files: Scientific Posters at MIU (Medical Illustration Unit), Faculty of Medicine, University of New South Wales. It includes tips on planning, design, and graphics. The poster templates can be found here. Our poster on BrainBasher (our BCI game) for the Fun and Games conference in Eindhoven is on the right. I’m quite happy with the end result, but one thing keeps bugging me. This is again the result of the discrepancy between commercial posters and scientific posters. Commercial posters focus on conveying one specific message and mainly use large images to do this — also for branding of course. 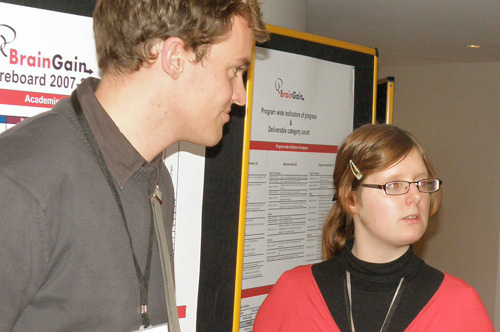 Scientific posters on the other hand contain a lot of text, as it wants to convey the relevance of the research done. This is just a hard thing to do with one catchy phrase and a pretty visual. On the other hand, the poster does have to catch the attention of people walking by at the conference, so that visual impact is still very important. I hope to eventually find this golden middle road that meets both requirements.